Modeler, Network Draughtsman (CAD and GIS), Network Survey & Data Manager, Network Survey & Data Manager and Document & Material Administrator vacancies on contract basis. The total available vacancies in this Delhi Jal Board Recruitment are 20 posts. Interested and experienced candidates may apply for the above DJB vacancies within 45 days from the date of publication in employment news. DJB Recruitment Notification has released on 13/December/2017. Download the application from the official web link of DJB @http://www.delhijalboard.nic.in. Submit the filled application through offline mode to the following address. 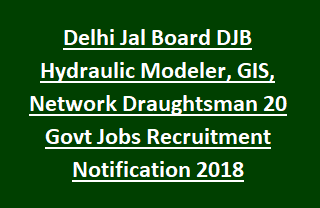 For more details of Delhi Jal Board DJB Recruitment of 20 Hydraulic Modeler, GIS, Network Draughtsman govt vacancies application form, notification dates are stated below. Total DJB vacancies available in Delhi Jal Board DJB Recruitment Exam are 20 posts given below. Total no of vacancies: 20 posts. 1. GIS Resource Required for Head Office: 04 posts. 2. GIS Resources required for each SEs Office: 08 posts. 3. Hydraulic Modeler: 02 posts. 4. Network Draughtsman (CAD and GIS): 02 posts. 5. Network Survey & Data Manager: 02 posts. 6. Document & Material Administrator: 02 posts. GIS Resource Required for Head Office/ Each SEs Office: Diploma/ Degree in Geography/ GEO information/ Civil/ Computer Science/ GIS & RS with two years experience in AutoCAD, Arc GIS and MS office. Hydraulic Modeler: B.Tech/ B.E in civil engineering with two years experience in DMA planning, Supervising Water Network Survey etc. Network Draughtsman (CAD and GIS): Diploma/ Degree in civil/ relevant certificate course for Auto CAD and Mappingskills/ ArcGIS drafting with two years experience in CAD & GIS work for water network. Network Survey & Data Manager: Diploma/ Degree in civil/ relevant certificate course for Topo Survey skills with two years experience in relevant field. Document & Material Administrator: Graduate in any discipline and 2 years experience in material management, Documents Management, Letter management etc. Candidates will be selected for DJB Hydraulic Modeler, GIS, Network Draughtsman Recruitment vacancies is based on written test. Interested candidates may apply for the above DJB Recruitment vacancies within 45 days from the date publication. DJB Notification has released on 13-12-2017. Get the application from the official web link http://www.delhijalboard.nic.in. Karol Bagh, New Delhi, Pin- 110005.